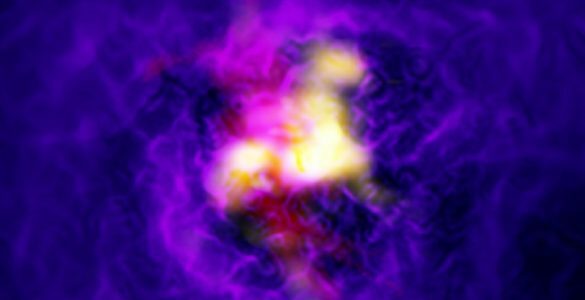 With the help of a gigantic cosmic lens, astronomers have measured the magnetic field of a galaxy nearly five billion light-years away. The achievement is giving them important new clues about a problem at the frontiers of cosmology — the nature and origin of the magnetic fields that play an important role in how galaxies develop over time. 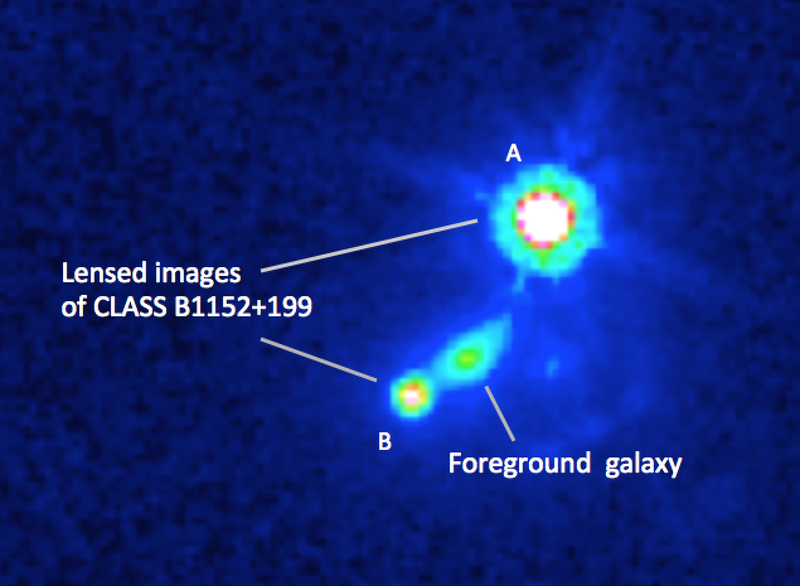 The scientists used the National Science Foundation’s Karl G. Jansky Very Large Array (VLA) to study a star-forming galaxy that lies directly between a more-distant quasar and Earth. 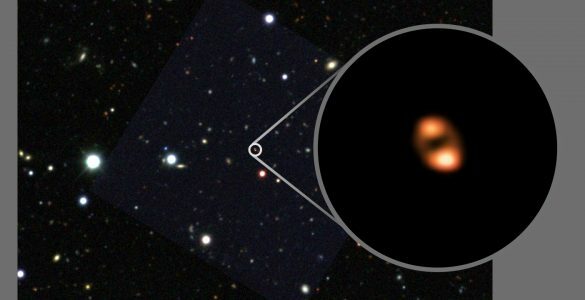 The galaxy’s gravity serves as a giant lens, splitting the quasar’s image into two separate images as seen from Earth. Importantly, the radio waves coming from this quasar, nearly 8 billion light-years away, are preferentially aligned, or polarized. 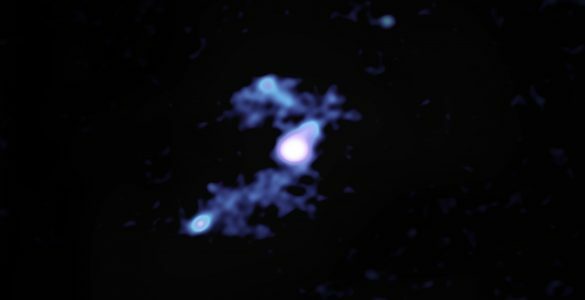 “The polarization of the waves coming from the background quasar, combined with the fact that the waves producing the two lensed images traveled through different parts of the intervening galaxy, allowed us to learn some important facts about the galaxy’s magnetic field,” said Sui Ann Mao, Minerva Research Group Leader for the Max Planck Institute for Radio Astronomy in Bonn, Germany. Magnetic fields affect radio waves that travel through them. 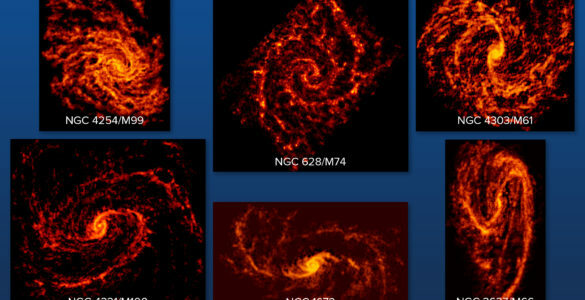 Analysis of the VLA images showed a significant difference between the two gravitationally-lensed images in how the waves’ polarization was changed. That means, the scientists said, that the different regions in the intervening galaxy affected the waves differently. “The difference tells us that this galaxy has a large-scale, coherent magnetic field, similar to those we see in nearby galaxies in the present-day universe,” Mao said. The similarity is both in the strength of the field and in its arrangement, with magnetic field lines twisted in spirals around the galaxy’s rotation axis. Since this galaxy is seen as it was almost five billion years ago, when the universe was about two-thirds of its current age, this discovery provides an important clue about how galactic magnetic fields are formed and evolve over time. “The results of our study support the idea that galaxy magnetic fields are generated by a rotating dynamo effect, similar to the process that produces the Sun’s magnetic field,” Mao said. “However, there are other processes that might be producing the magnetic fields. 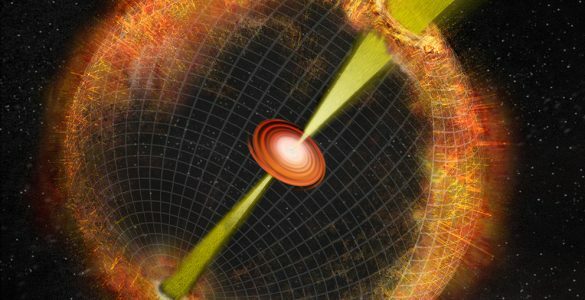 To determine which process is at work, we need to go still farther back in time — to more distant galaxies — and make similar measurements of their magnetic fields,” she added. 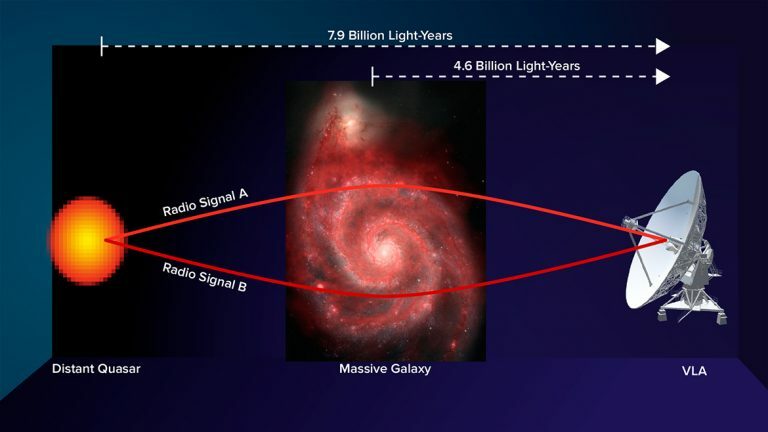 “This measurement provided the most stringent tests to date of how dynamos operate in galaxies,” said Ellen Zweibel from the University of Wisconsin-Madison. Magnetic fields play a pivotal role in the physics of the tenuous gas that permeates the space between stars in a galaxy. Understanding how those fields originate and develop over time can provide astronomers with important clues about the evolution of the galaxies themselves. Mao and her colleagues are reporting their results in the journal Nature Astronomy. 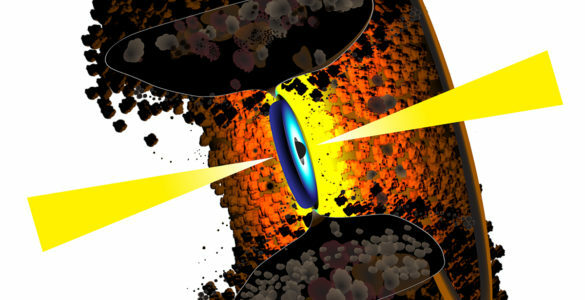 Artist's conception of gravitational lens arrangement that allowed astronomers to measure galaxy's magnetic field. 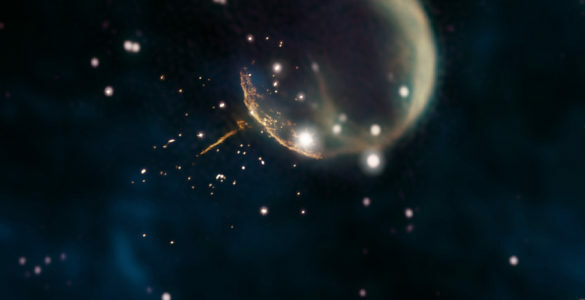 Hubble Space Telescope image of galaxy and gravitationally-lensed images.